We’re ready to help with Making a List and Checking It Twice. We’re here to help you make sure you’ve got everyone checked off your list. Once you’ve decided who you want to remember this holiday season, you can choose which gift you want to send and include a personalized message for each one. Our friendly staff can answer all of you questions and help you choose the best delivery date. We’re proud that many long-term customers return because of our customer service and beautifully crafted products. 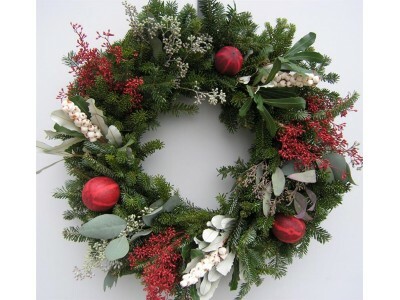 Your clients will be Rocking Around The Christmas Wreath. Our wreaths are individually crafted from greenery grown on our farm and transformed into unique creations here in Michigan. We ship to addresses across the continental United States with UPS. We’ve delivered 98% of our packages on the day requested, but we work hard to ensure every delivery is made on the day requested. Let us know when you want your gifts delivered, and know we’re working hard to fulfill your order. Evoke a Winter Wonderland, even when it’s not cold outside. Evergreens are a universal sign of the holiday season. Our wreaths are a timeless classic – which means your corporate Christmas gifts are sure to be a hit. When you want to show your gratitude to your colleagues in the business world, hand-crafted wreaths send the right message. Start your shopping here by fulfilling your need for a unique corporate Christmas gift.